It’s been a crazy four years for ToeJam & Earl, an alien rap duo that crash landed on Kickstarter back in 2015. Throughout the game’s development, its inclusion to consoles was up in the air. 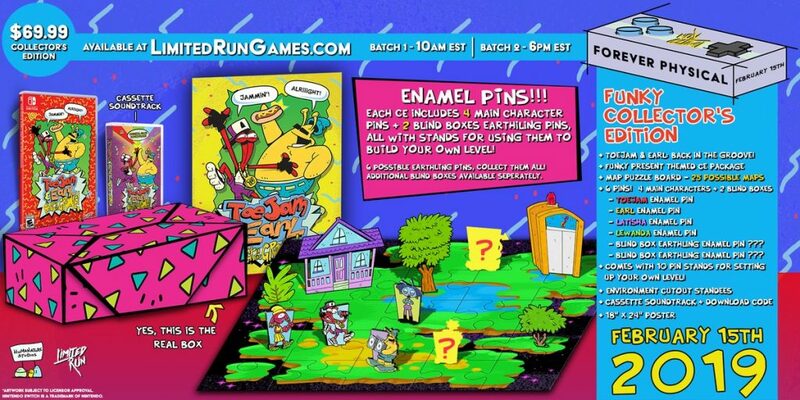 And now, thanks in part to Adult Swim Games, ToeJam & Earl is finally making its way to the current console generation. Announced for Nintendo Switch last year during a February Direct, the release date is now fast-approaching. Before we turn our calendars to March, Limited Run Games is giving physical copy collectors to pre-order the game prior to its release. As for the standard edition, it will be on the market for a tad longer — 45 days to be exact. After that, all pre-orders will be fulfilled and you’ll have to hunt down copies in the secondhand market. Set your alarms for this Friday with some sweet tunes! Hopefully this will make the game’s wait a tad more bearable, when it launches on March 1st.